Lack of local access to or affordability of healthy food is an unfortunate reality for one in four Native American families. In fact, these families are 400 percent more likely to report not having enough to eat, compared with other U.S. households. And although the U.S. government provides commodities to help feed low-income Native families, as they do for other low-income Americans, these foods are often sorely lacking in nutritional value. Unsurprisingly, this lack of healthy nutrition has led to a wide array of health issues among all age groups. In fact, Native Americans have the highest prevalence of diabetes in the country, and are nearly twice as likely to die from diabetes as other Americans. 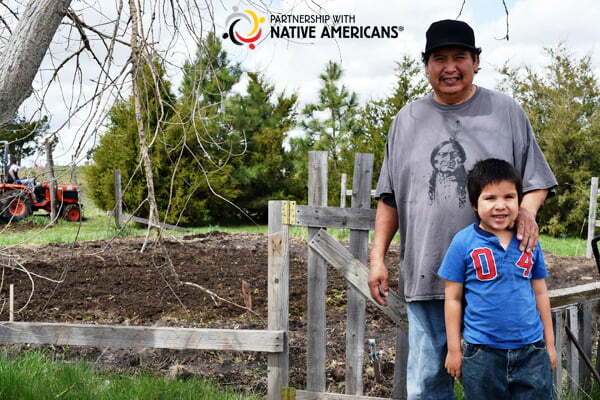 With support from individual and organizational donors, Partnership With Native Americans (PWNA) addresses food insecurity across 12 states. Aimed at supporting healthier communities and building brighter futures, PWNA’s food solutions focus on accessibility to healthy food, as well as nutrition training, garden support and garden training. PWNA’s Project Grow tackles the problem at the root, empowering individuals and reservation communities to access healthier foods through gardening. Just as gardening yields its bounty of healthy food for years to come, so too do the efforts undertaken by PWNA and tribal communities to address long-term solutions surrounding nutritional health. Through support and training on how to plant and raise fresh produce, communities are taking control of their own food sources. Many of PWNA’s reservation partners are requesting healthy cooking classes and training on food canning and preservation. Using its mobile training units, PWNA connects Native American chefs and local cooks who collaborate on introducing fresh produce and healthier recipes to remote reservation communities. Educational demonstrations further show residents how to cook healthier recipes utilizing locally available foods. 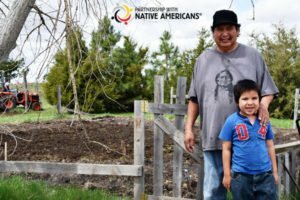 Tribal communities are also integrating their own traditions and culture into these garden projects, encouraging members to get involved and stay engaged in the project of building sustainable food sources that improve lives. By energizing the community with resources and education, PWNA supports community-led solutions with impact for years to come. Through all these efforts, PWNA and its reservation partners are motivating and equipping tribal citizens with knowledge and healthy nutrition habits that will trickle down to the next generations. These initiatives support a return to a healthier, more traditional diet that is free of processed foods. As individuals adopt these tactics, entire communities benefit from a shared, sustainable solution that alleviates the compound effects of food insecurity. This entry was posted in Humanitarian, Programs and tagged diabetes, food deserts, food insecurity, gardening, healthy eating, nutrition, project grow. Bookmark the permalink. Trackbacks are closed, but you can post a comment.